I shared last week about our trip to Hawaii with general photos – I hope you enjoyed them! 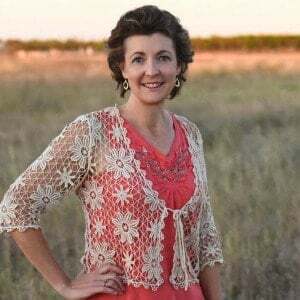 This week I want to show you some of our favorite spots on the island. Many of them are, of course, beaches. After all, we are talking Hawaii! 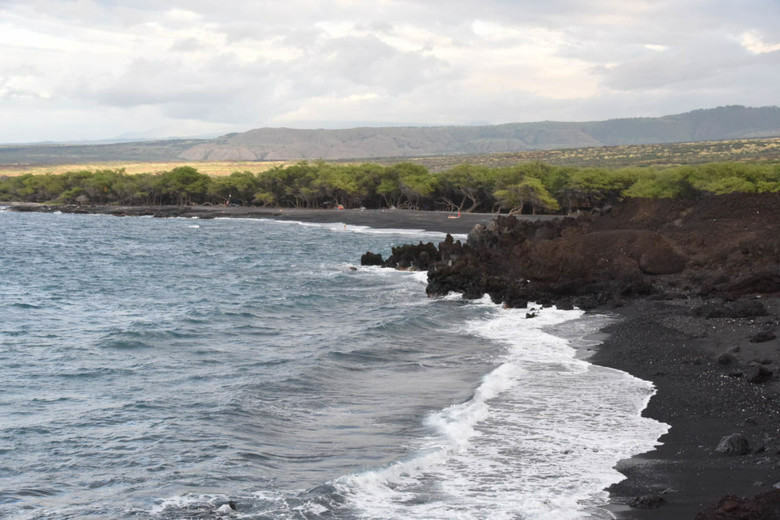 One of the most beautiful beaches had black sand – Kekaha Kai State Park! The sand was smooth and fine like the white sand of the gulf coast – only black. Beside the beach in Kekaha Kai State Park was a cliff that of course the guys enjoyed climbing. We won’t talk about the boulders they tossed over the edge to create a new coastline – boys will be boys! We rented a surfboard early in the trip and the boys all took to it quickly. Surfing was likened to fishing – you know how much fun fishing is when the fish are biting but otherwise, you wait. Surfing is a lot of fun when you are riding the wave but between waves – you wait! One beach we visited a couple of time was Hapuna Beach. While this is a state park that requires payment for parking, we found that if you park on the road and walk in, it’s free! Yes, we are talking Hawaii on a budget! 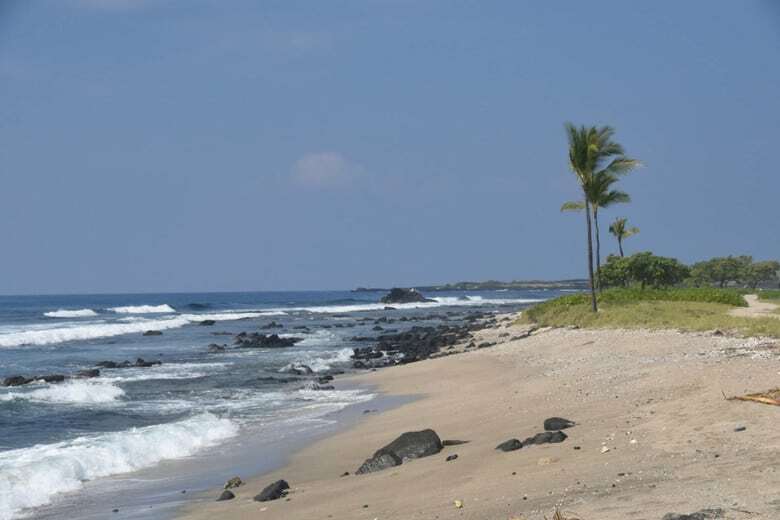 Probably the calmest and most picturesque beach was at the Mauna Kea Resort. 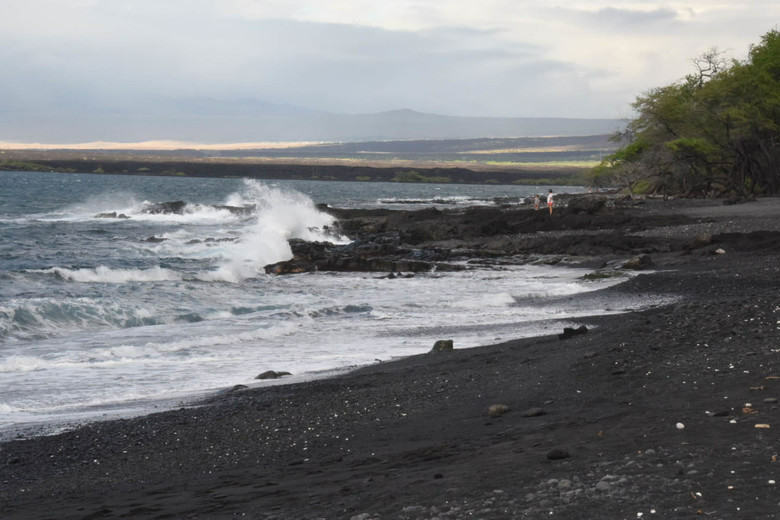 There is a large hotel on this beautiful beach – an interesting fact about Hawaii is that beaches are considered public property and must have public access even if the most luxurious hotel is there! 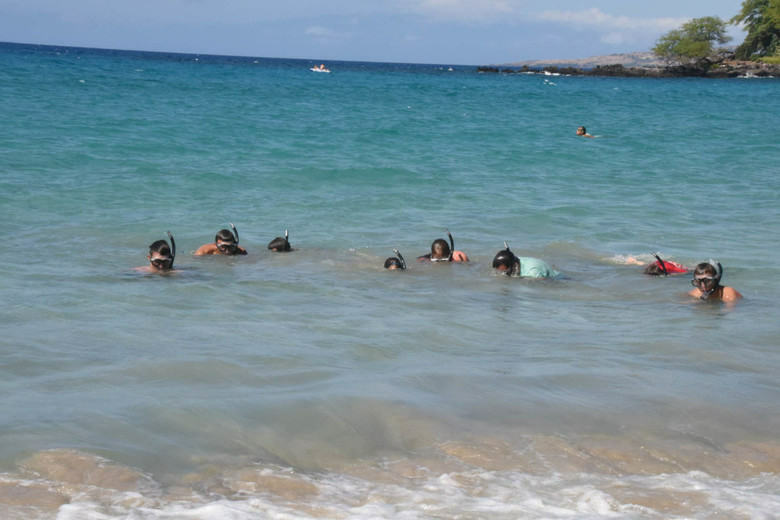 This was a great place to snorkel. 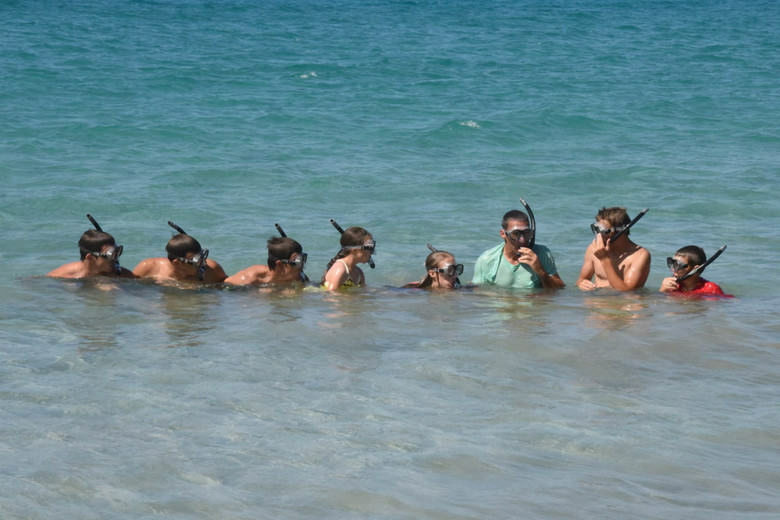 I was trying to get a series of photos with everyone going down and coming up together to clear their tubes – our timing was off as was our choreography which made for a lot of laughs! Besides the beaches, we also visited Mauna Loa which is the active volcano on the island. Unfortunately, the lava was not flowing while we were there because it is suppose to be spectacular at night. Lava tubes are formed formed by flowing lava which moves beneath the hardened surface of a lava flow. When the lava cools, cavernous tunnels are left. 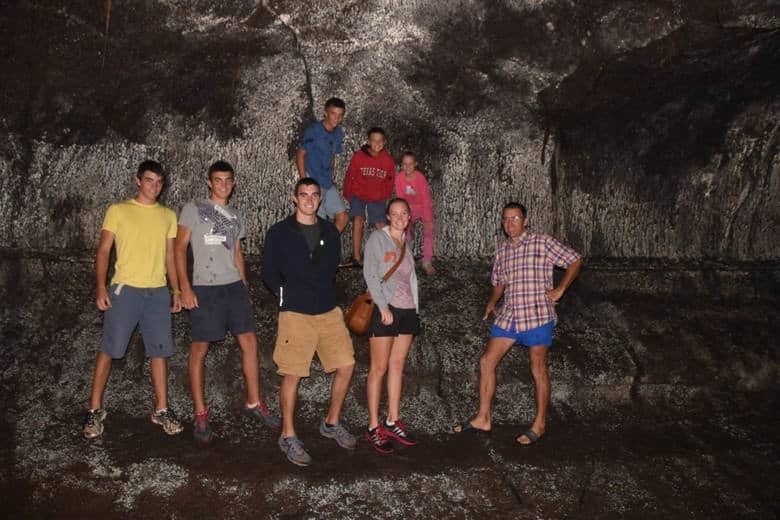 The lava tube makes a great backdrop for a photo! 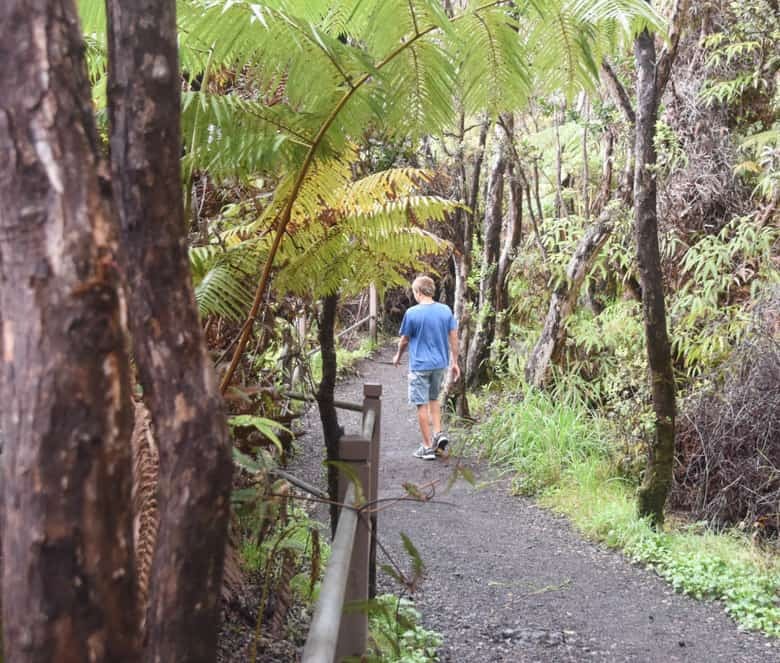 The area around Mauna Loa is a rain forest – lush, green and damp. During our hike it was wet and drizzly. 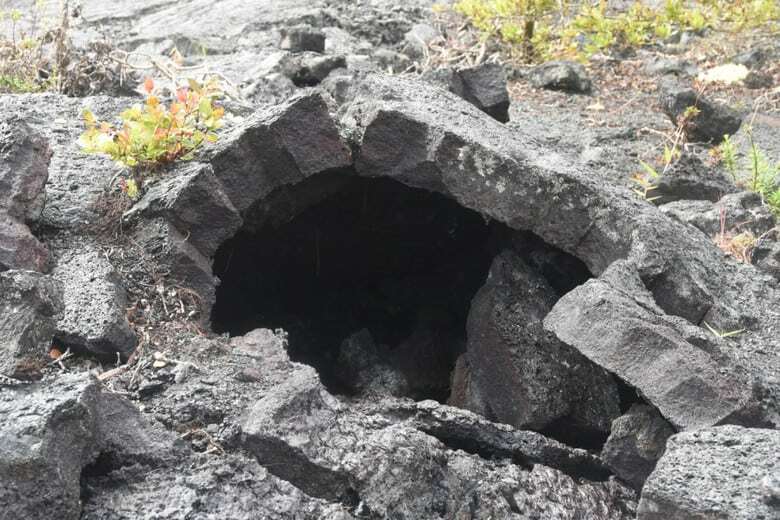 Lava tubes are visible around the island on the sides of the roads. We decided they would make neat tents or hiding places. 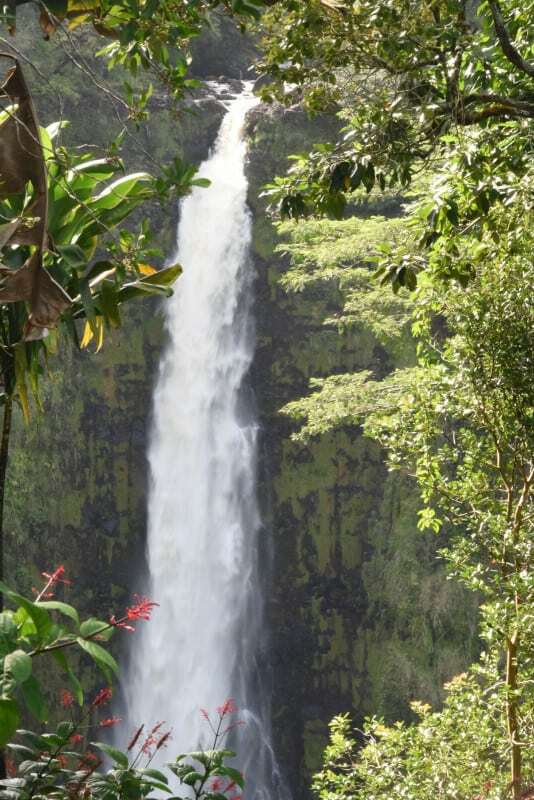 The Hawaiian waterfalls are also gorgeous. The largest was Kakaka Falls. 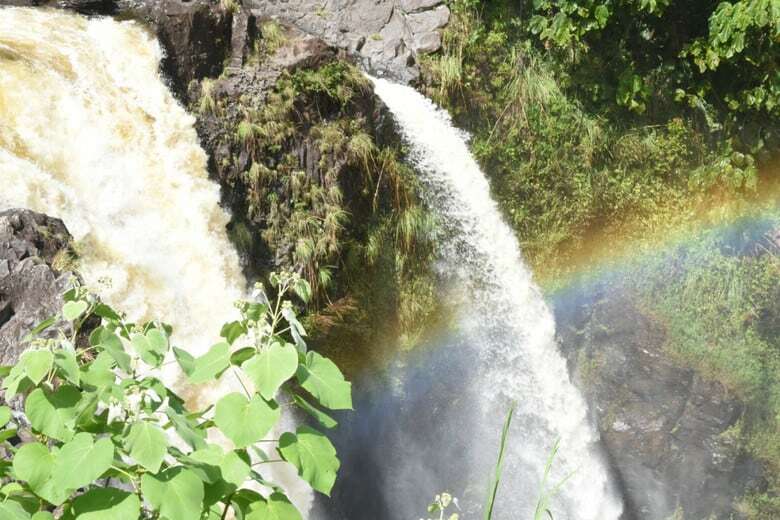 Then there was Rainbow Falls which as the name says, sports a rainbow from the mist! 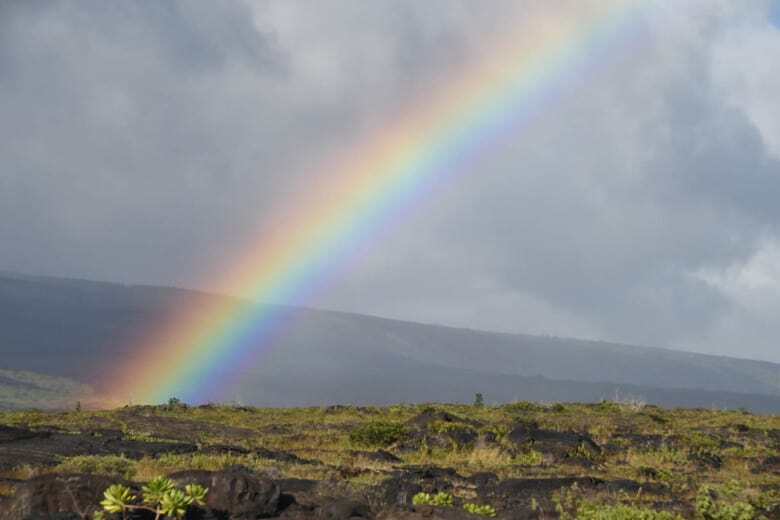 We also saw a rainbow as we drove up the mountain of lava from the beach at Kalapana in Volcano National Park. 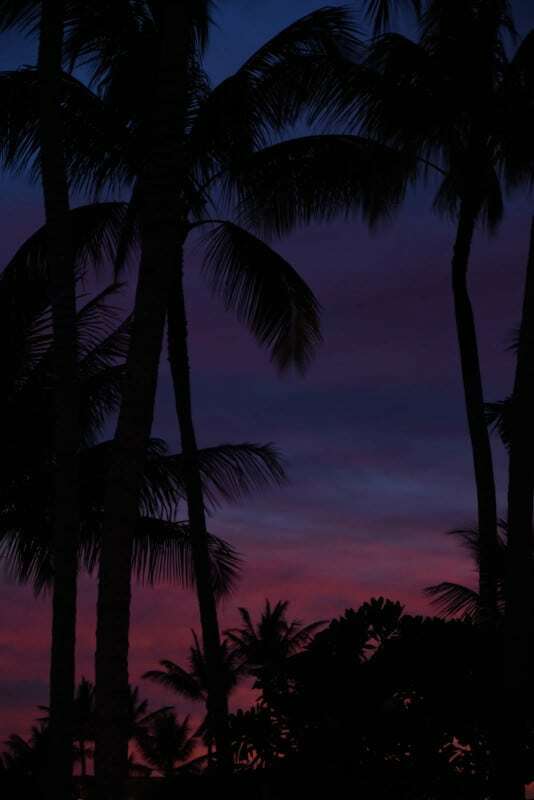 There are many other photos I would like to share with you but I’ll end on one of my favorites – a Hawaiian sunset for you to enjoy! Beautiful photos! I love Hawaii. 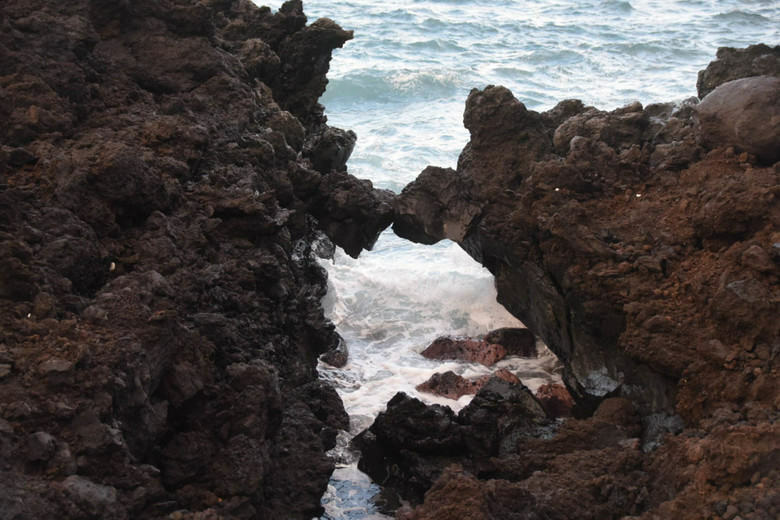 We usually go to Kauai because it’s less touristy and more relaxing than some of the others, but have been to Maui too. It’s so beautiful and so many different things to see and do. So glad you and your family had such a wonderful vacation! Thanks, Gay, it was amazing to see the variety of God’s creation! That is good to know about Kauai if we ever get to go again.